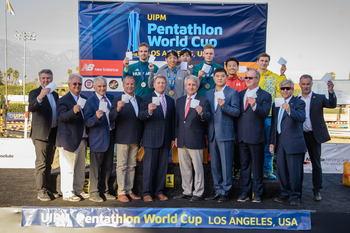 Lee Jihun of Korea scorched his way to a scintillating gold medal as he dominated the field to win the Men’s Individual Final at the UIPM 2018 Pentathlon World Cup Los Angeles. The world No.21 made a mockery of his outsider status as he produced a near-perfect performance across all disciplines to claim his first World Cup gold medal and ensure that the day’s climax — the Laser Run — was all about the battle for silver and bronze. That would prove to be a hugely dramatic conflict as Ukraine icon Pavlo Tymoshchenko hauled himself up from a starting position of 11th to fight all the way to the finish line for a medal. However, a sensational sprint finish went the way of his two rivals from Hungary. 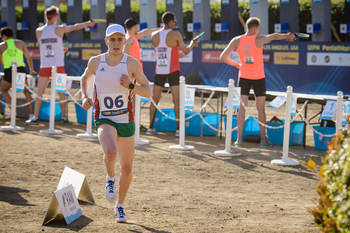 Silver was won by Bence Demeter with compatriot Balazs Szep narrowly claiming bronze in the second competition of the UIPM Modern Pentathlon season. The heroic efforts of Tymoshchenko (UKR) earned him fourth place while the top six was rounded out by Jun Woongtae (KOR) in 5th ahead of Shohei Iwamoto of Japan, whose performance will continue to raise anticipation ahead of the next Olympic Games in his home country at Tokyo 2020. Indeed, with three Asian athletes among the top three, Los Angeles provided further evidence of the growing strength of the continent’s top competitors. 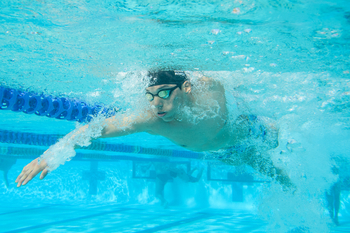 “Today everything was good: Laser-Run, Riding, Fencing and Swimming,” said Lee (KOR). “For the Korea team it was a great day, with Jun Woongtae also finishing in fifth. The day began well for the host nation as Amro Elgeziry of the USA was joint-fastest in the pool, exactly matching Joe Choong’s time of 1.59.38 with Choong’s Great Britain teammate Jamie Cooke back in third. In a sign of what was to come, three Koreans — Jung Jinhwa, Jun and Lee — were among the top seven. As the action moved indoors, Lee (KOR) began to really take command with his score of 25V/10D only matched by the Olympic champion Alexander Lesun of Russia. The class of Tymoshchenko (UKR) was also beginning to show with his score of 24V/11D and Demeter (HUN) was not far behind with 23V/12D. While Elgeziry (USA) and Choong (GBR) enjoyed early success in the Bonus Round, it was Demeter (HUN) who racked up two victories before Lee (KOR) came out on top on the piste, his lead stretching after two events. A total of 12 athletes recorded perfectly clean rounds to rack up a maximum of 300 points. Unfortunately for his rivals, Lee (KOR) was amongst them. The other riders to take a maximum score from the course were Szep (HUN), Kirill Belyakov (RUS), Sergio Villamayor of Argentina, Giuseppe Parisi of Italy, Pierre Dejardin of France, Esteban Bustos of Chile, Pavel Ilyashenko of Kazakhstan, Li Shuhuan of China, Patrick Dogue of Germany, Martin Vlach of Czech Republic and Thomas Toolis (GBR). Lee (KOR) started with a lead of 12 seconds but in truth it felt like much more than that as he continued his blistering pace to stay out in front of Lesun (RUS), who was next to leave the starting blocks with Demeter (HUN) just three seconds behind and home favourite Elgeziry (USA) a further 14sec back. But while Lee (KOR) stayed comfortably ahead of the field — shooting with unerring accuracy — things started to get very interesting very quickly behind him. Tymoshchenko (UKR), the silver medalist from the Rio 2016 Olympics, chewed up the handicap to put himself right into contention and with lots of impressively composed performances on the shooting range the pack bunched up into an unmissable final lap. In the exhilarating sprint finish, Demeter (HUN) managed to force his way to silver while youth got the better of experience with Szep (HUN) just pipping Tymoshchenko (UKR) to bronze, the first World Cup medal of his promising career and Hungary’s third of the week in Los Angeles after Tamara Alekszejev (HUN) took bronze in the Women’s Final. UIPM President Dr Klaus Schormann said: “The men’s final was one of the most exciting finishes we have seen in many years. That drama shows that the athletes will always give their all. It was a very exciting moment today. “We had a high level, like yesterday and new faces, like the young Hungarian athlete in third. I underline again that our federation is preparing athletes for the future. Not only for 2020 in Tokyo but already focusing on 2024. 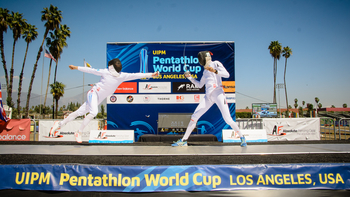 UIPM 2018 Pentathlon World Cup Los Angeles concludes tomorrow (March 30) with the Mixed Relay. Tune in to UIPM TV for live coverage and visit the UIPM website for all results.